Assessing women for perinatal depression involves considering psychosocial factors that are known to be associated with a high likelihood of mental health disorders in the perinatal period, and identifying possible symptoms using the Edinburgh Postnatal Depression Scale (EPDS). 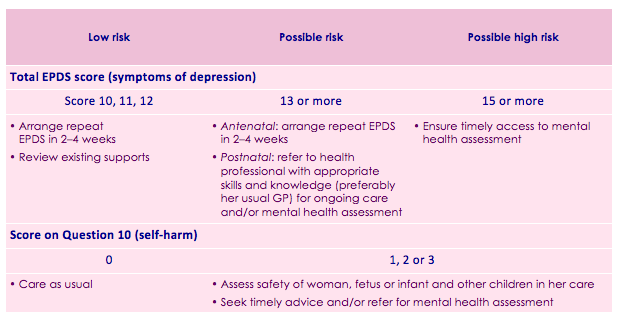 The EPDS is a questionnaire developed to assist in identifying symptoms of depression in the postnatal period. It also has adequate sensitivity and specificity to identify depressive symptoms in the antenatal period and is useful in identifying symptoms of anxiety. The EPDS is not a diagnostic tool; rather it aims to identify women who may benefit from follow-up care, such as mental health assessment, which may lead to a diagnosis based on accepted diagnostic criteria (DSM-IV-TR or ICD-10). Translated versions of the EPDS have been validated in some languages. All women should complete the EPDS at least once, preferably twice, in both the antenatal period and the postnatal period (ideally 6–12 weeks after the birth). The non-diagnostic nature of the EPDS, its purpose and the fact that it relates to the previous 7 days (not just that day) should be clearly explained. Clinical judgement is integral to interpreting EPDS scores, as in some cases the score may not accurately represent a woman’s mental health. For example, a woman may have a low score, even though there is good reason to believe that she is experiencing depressive symptoms. A very high EPDS score could suggest a crisis, other mental health issues or unresolved trauma. Scores may be influenced by several factors, including the patient’s understanding of the language used, their fear of the consequences if depression is identified, and differences in emotional reserve and perceived degree of stigma that is associated with depression. In the management of perinatal depression, a total score of 13 or more is considered a flag for the need for follow up of possible depressive symptoms. In the antenatal period repeat the EPDS in 2-4 weeks if a woman’s score is 13 or more in line with clinical judgement. If the second EPDS score is 13 or more, refer to an appropriate health professional, ideally the woman’s usual GP. In the postnatal period arrange referral or ongoing care if a woman’s score is 13 or more in line with clinical judgement. Follow-up may also be needed if scores on Questions 3, 4 and 5 suggest possible symptoms of anxiety. For scores of 1, 2 or 3 on Question 10, the safety of the woman and children in her care should be assessed and, according to clinical judgment, advice sought and/or mental health assessment arranged.